We're five days out from Christmas, and our tiny kitchen has been basking in holiday baking merriment, whirling in cookie rolling flurries, and pulsating with disproportionate stressing over keeping to a baking schedule. The yields from all this activity? Gingerbread, (almost) exclusively. 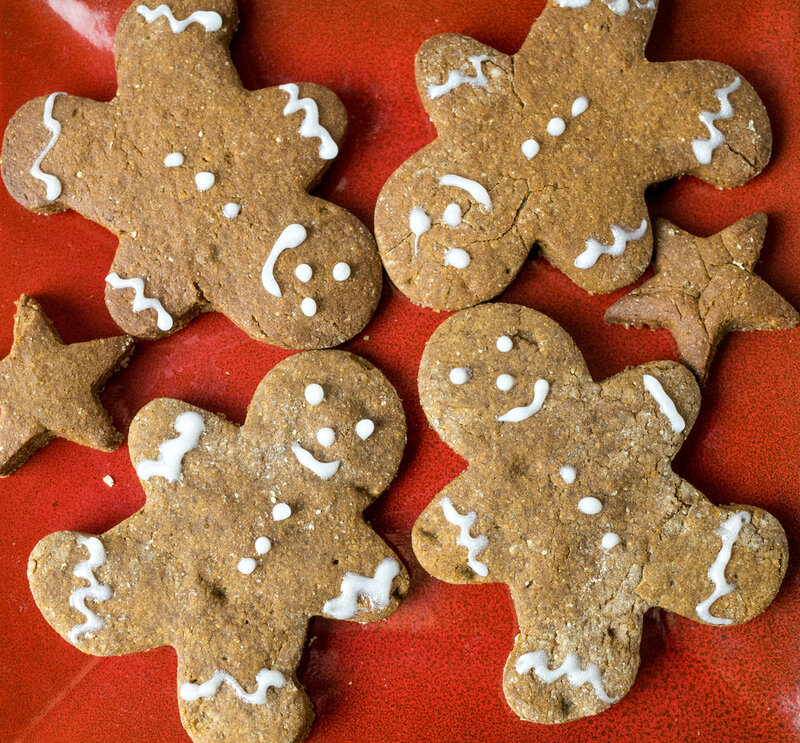 Gingerbread people, stockings, trees, and stars, once cooled whisked into packages or freezer for gifting. Last year I made no less than six varieties of holiday cookies, mostly for a merrily scrumptious recipe project. This year, I've looked on admiringly with a touch of envy at friends' Insta-feed's spectacular cookie assortment displays. Not that there hasn't been variety within our gingerbread parades. We started with this gluten free, vegan recipe I created for Ancient Harvest last year. Then I found this marvelous, perfect recipe from Cookie and Kate, which turned out beautifully using One Degree Organics' sprouted whole wheat (2 cups) and sprouted rye (1 cup) flours. Finally, this mash-up of the two, which was splendid. I'm sure chickpea or your favorite gluten free flour blend would do as well as the quinoa. For vegan cookies, just replace the egg with one flax egg (1 tablespoon flax meal with 2.5 tablespoon water) and add in 1/4 cup almond butter. If you'd prefer nut-free, you can afford to lose the almond butter. I just think it gives a little helpful boost of solidness. But the real difference in all these gingerbread batches has been in the spirit of the baking. Last week, we spent just under a week on the east coast for an early Christmas with my family. It was a quick, packed, lovely week and we all came back cranky. Maybe there was a little big of post-holiday anticlimax happening, despite returning to our tree, lights displays, a string of more holiday fun to look forward to. Maybe it was hormones (mine). Most likely it was the snowball effect that time zone adjustments, lost sleep, excitement, lots of stimuli, and the roller coaster of being three can have on a little person, and the ensuing impact of that little person's big feelings on their big people's emotions. In any case, we were all rather crabby in spurts, especially me. What made the humbugginess sting a little more was guilt that came with reminders that for many, this is a season of sadness; when even focusing on loving and giving comes packaged with the painful ache of loss and longing. Three days into curmudgeonly impatience, and conscious shake-off steps needed to be taken. So today little F and I had a perfect day, sprinkled with the best of lovable imperfections. Early in the morning, little F and I sorted through clothes and bundled up a stack to take to the OUR Center, an amazing local resource providing a range of individualized, personal support for people in need. It was just a quick, friendly drop-off, but afterward I heard Little F telling Monkey in the car, "Monk, some kids don't have toys. Some kids don't have warm clothes. Some kids don't have food, Monk." If that didn't get my grinchy heart back to it's usual size...I'd be lying if I even suggested it. He is listening came the thought, leaving me renewed with bubbling gratitude for my magical, inquisitive, can-do determined sometimes-threenager. After, we went ice skating. And we baked cookies. 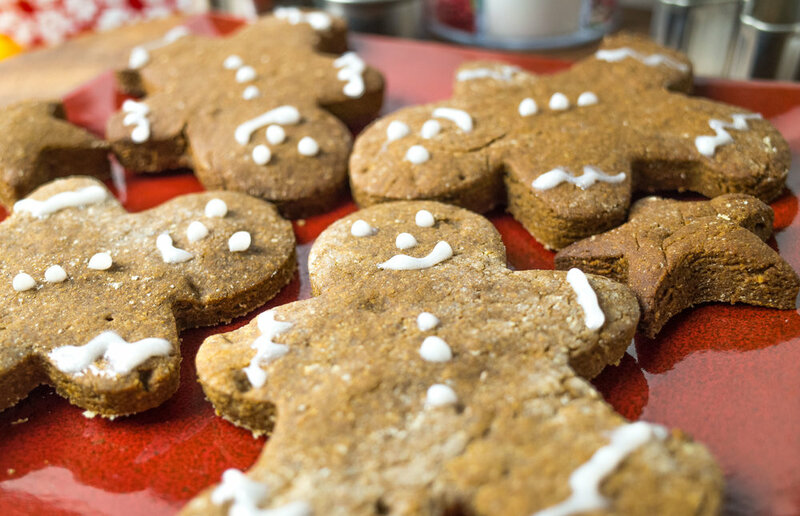 More "ginger-man" cookies--therapeutic, giggle-inducing while at the same time calming cookies. Rolling the dough, cutting our the shapes...it was a timely throwback to the simple joy of playdough, and it was just what I needed. We dusted with coconut sugar "sprinkles" and pressed in raisin eyes, mouths, and buttons. It's an obvious irony, how the holidays enfold us with repeated messages of what they're all about...peace, love, togetherness...and at the same time sweep us up into frenzied motions that leave us mentally at the opposite pole. Today the message resonated. Today we stopped and smelled the cookies. Happy holidays, friends! In a bowl, whisk together flour, baking powder, baking soda, salt, and spices. In a separate bowl, mix brown or coconut sugar, molasses, coconut and olive oils and beat on a low with a mixer to thoroughly blend. Beat in egg or flax egg and almond butter. Line a baking sheet with silpat or parchment paper. Carefully roll out dough on a floured surface to approximately ¼ inch thickness, sprinkling the top of the dough with flour as needed before rolling. Carefully cut dough into desired shapes. Place on baking sheet one inch apart. Sprinkle with coconut sugar and decorate with raisins if desired. Bake for 8-10 minutes or until cookies appear only slightly browned on the edges. Let cool and sprinkle with powdered sugar or ice if desired.